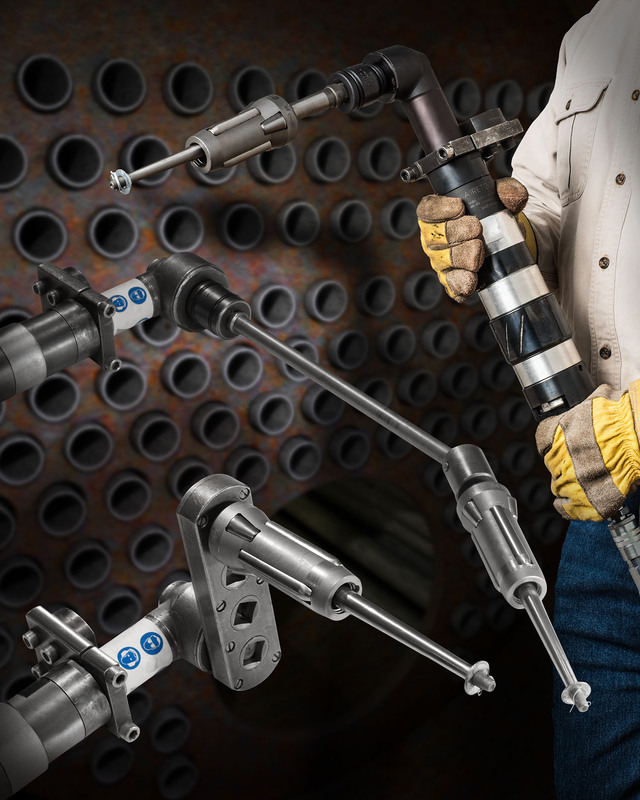 A full line of tube expanders offered with universal pivoting extensions that easily attach to torque controlled rolling motors for hard to reach tube sheet is being introduced by Esco Tool of Holliston, Massachusetts. Esco MILLHOG® Rolling Motors and Tube Expanders are air-powered and feature a torque control setting which stalls the tool when it reaches the desired tube expansion to create a uniform and tight mechanical seal. Featuring a wide selection of adapters and universal pivoting extensions, they let users easily reach around obstructions and roll hard to access boiler tubes. Supplied as complete kits for straight-, flare-, long-reach, and beaded rolls, Esco MILLHOG® Rolling Motors and Tube Expanders are available with 90-, 190-, and 280 RPM motors that operate on standard shop air. Providing precise torque control from 25 to 325 ft.-lbs., they are easy to adjust and ideal for rolling tubes from 3/8” to 4-1/2” O.D.